Hope these post bless you/make you laugh/make you think. Enjoy! I've only read Chip's blog. Moving on to the rest! 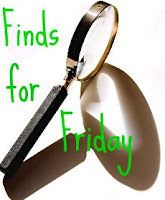 Have a great weekend and thanks for the Friday Finds! thanks, Jess - hope you were blessed by the others :) I know I was. Thanks for the shout out, Joanne! Finds for Friday sounds like fun.